Carefully cut the ends off of the spaghetti squash and then slice in half lengthwise to make two long bowls. Scrape out and discard the seeds. Spray or lightly coat the inside and edges of each half, then toss 1 tablespoon of minced garlic into each. Place on a baking sheet, bowl side up, and bake for 30 to 45 minutes - until the edges are browned and the flesh comes away from the skin easily. Remove from the oven and rest 10 minutes. 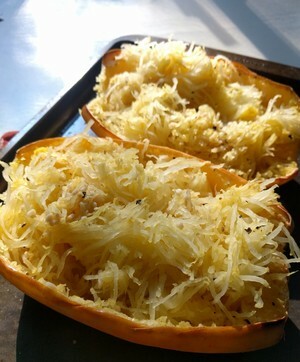 Use a fork to scrape the inside of the squash into "noodles" and serve as-is or under a dollop of your favorite sauce. Don't add very wet sauce to this and let it sit, as the squash will absorb the water and turn to overcooked mush. It's better to serve with veggies or a thick and chunky sauce.